This category includes Asiago, Parmesan, Provolone, Romano and Mozzarella. In 2012, Wisconsin produced 1.4 billion pounds of Italian varieties, making Wisconsin the No.1 producer of Italian cheeses in the nation. From hamburgers to macaroni and cheese, Cheddar is an American classic. Wisconsin keeps our burgers cloaked in gooey goodness by producing 572 million pounds of cheddar cheese. The versatility of Mozzarella makes it the most widely produced Italian cheese in Wisconsin. 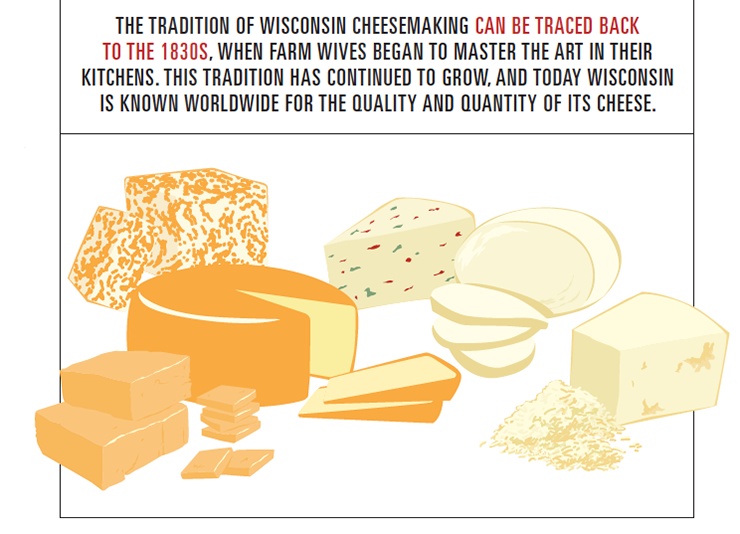 The state’s cheesemakers produced 951.2 million pounds, or 25.2 percent of national production, in 2012. This semi-hard cheese may have originated in Italy, but in 2012, Wisconsin produced 183 million pounds, or over half of the nation’s Provolone cheese. This category includes Cheddar, Colby, Monterey Jack and others. Wisconsin was responsible for producing 829 million pounds of American varieties in 2012, and was ranked No. 1 in the nation. Often shaved or grated, Parmesan can be used in a variety of dishes, such as pasta, soups or meat dishes. Wisconsin produced 123 million pounds or 42.7 percent of the nation’s Parmesan, in 2012.